LES GARRIGUES [Celtic "gar" means rock and "garric" tree of the rock; in Occitan, "garic" means ‘chêne kermès’ or stunted holm oak]. alking the Garrigue & Nîmes is something of a sensual experience. The vast lowland region stretching from Nimes north and north west is the Languedoc garrigue and covers the northern half of the department of The Gard. These limey soils, averaging between 100 and 400 metres in altitude on average, present a typical vegetation characterised by dense thickets of stunted holm oaks and Juniper trees on the open landscapes, punctuated by the ‘arbousier’ or strawberry tree, an absolute joy to behold. In fruit in October, it makes a special feature for all of us local hikers fortunate enough to see them in October, the month that many walkers consider the best time for hiking and trekking in Languedoc and Provence. Whilst all of the walking holidays offered by The Enlightened Traveller are available until the end of October, Walking France’s Garrigue is available all year round. 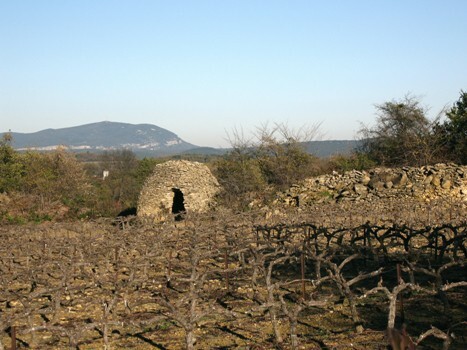 Aromatic lime-tolerant shrubs such as lavender, sage, rosemary, wild thyme and Artemisia are common garrigue plants, but one also sees camomile, cactus, sage, myrtle and broom – not to forget the vine, as Languedoc is the largest wine producing region in France. Walking on the slightly higher slopes of the Cevennes foothills, one finds the ‘maquis’ or thicket, characteristic of the English heath, but with much taller shrubs – typically 2 to 4 metres in height as opposed to 0.2 to 1 metre in England. 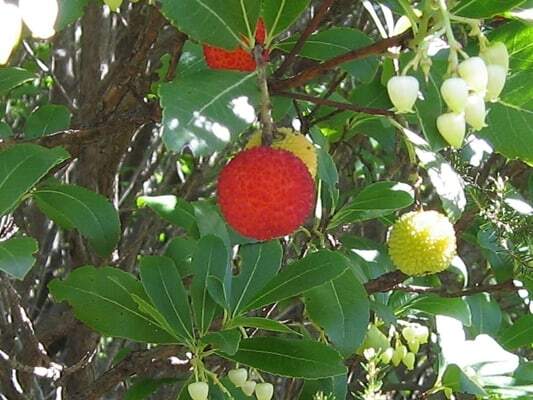 A similar habitat type in North America is known as chaparral, although the kinds of shrubs found are different. The often extremely dense nature of maquis made it ideal cover for Camisard fighter in the early 1700s and their Second World War guerrilla counterparts, the French resistance movement, The Maquis. 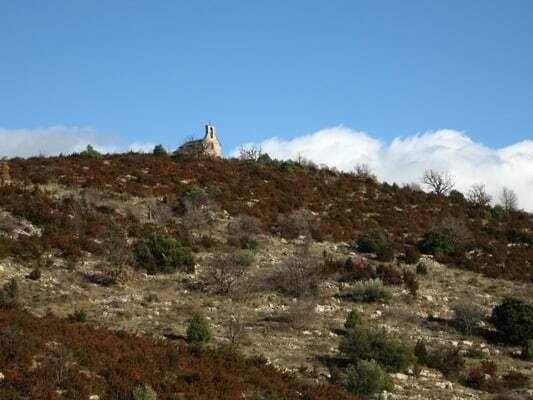 Just as man has left his mark in the Cevennes hills, the garrigue is very much the result of human endeavour since the Late Bronze Age. Deforestation of the indigenous oak and pine forest for the cultivation of olives, vines and grain, as well as the introduction of sheep and goats (and later charcoal-making for heat and iron-working), exposed the land surface to weathering and resulted in massive erosion of the topsoil. Little by little, the primitive forest gave way to sporadic woodland interspersed with low vegetation that is largely evergreen. Thanks to the wind (le mistral) and rain, and the porous limestone soils, surface erosion has fashioned the many grottos, caves and gorges which make walking in the region such a delight (both above and below ground!) 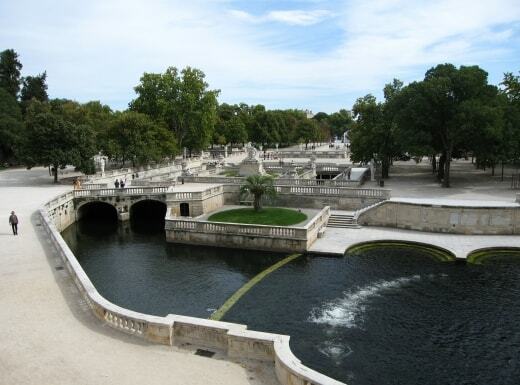 and the waters that have filtered down into the soil occasionally resurge as springs as is the case with la fontaine de Vaucluse and la fontaine de Nîmes. For those familiar with walking in France, and especially The Gard, the garrigue is the home of dry stone (la pierre sèche) and the Gard is the richest department in France for this ever-scarcer natural resource. The many dry stone constructions that scatter the countryside. 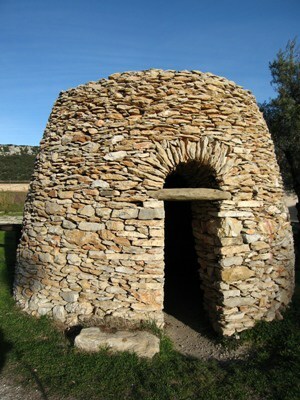 Les capitelles are small multi-purpose drystone shelters. Winemakers and other harvesters used them as temporary protection for harvested olives, grapes or wheat; shepherds, as short-term refuge from the inclement weather as well as temporary caches for their agricultural tools; colliers, for storing their wood. In the seventeenth and eighteenth centuries, they were even used as places of worship and prayer for persecuted Protestants. Each local area has its own characteristics. For example, they often have a square base around Nîmes, whilst in Uzège the form is that of a dome with a circular base. Near Blauzac, a two-hour hiking France tour allows you to observe a dozen. Le maset is a small country outbuilding. These were used for leisure by workers in the nineteenth century. 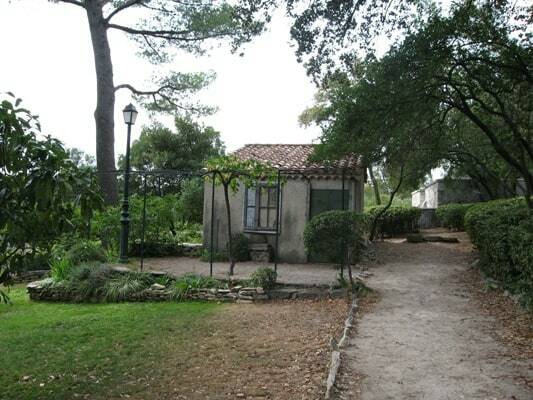 They are built in stone and lime mortar, with a shady arbour and a piece of ground for playing pétanque (boules). 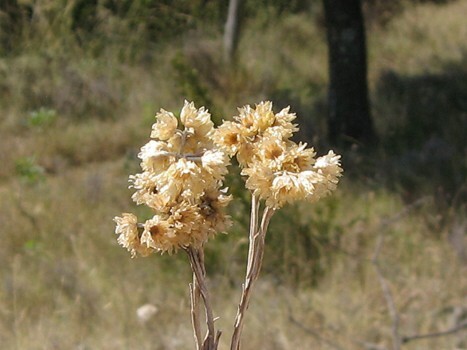 There may only be one word, ‘garrigue,’ but there are definitely different shades of ‘garrigue’, from plain to rolling lowland to foothill and hill. Moreover, the vegetation and soil cover can vary from dry earth, to gravel and loose stone to solid limestone pavement. Nevertheless, they all seem to bear fine wine, are all facets of ‘Garrigue’ and part of its enduring fascination. The best way to view it in all its glory is as part of a day’s walk to Montcalm or Mont Bouquet on our Walking the Cevennes and Hiking Valcezard walking tours, respectively. Our a la carte walking holidays in France are already available to introduce you to the multi-faceted Garrigue for those wishing to combine light bucolic hiking with cultural discovery. Please contact us about this and our forthcoming Walking the Garrigue independent hiking tour. Nîmes and its surrounding hinterland offers an abundance of opportunities for cultural urban walking and countryside hiking. The City itself is rich in history and boasts numerous sites of historic interest that one can discover as part of an urban ramble – guided or self-guided. 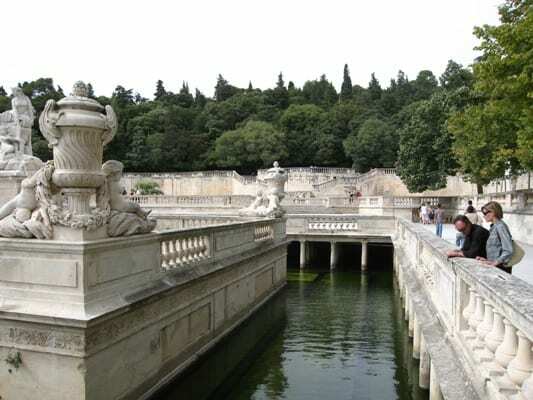 Nîmes is home to more than twenty-one parks and gardens, ideal for family rambling and leisurely hiking in calm and verdant surroundings. Some of these suburban ‘green spaces’ offer short bucolic rambling trails. A little further afield, the City’s surrounding countryside is adorned with several hills and small limestone plateau that support a Mediterranean vegetation that is particularly adapted to this undulating but low-lying topography. This is the terrain known locally as ‘la Garrigue.’ It is spelt without an ‘s’ at the end. 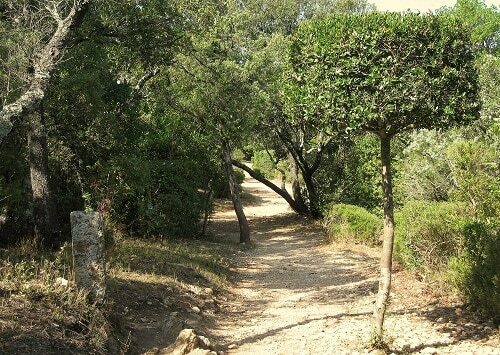 North of the City, and less than two kilometres from the centre, one finds a woodland area stretching for 83 hectares, which offers ample opportunity to explore the myriad riches of the Garrigue along gentle pathways, ideal for half-day hiking and family walking. Similar examples exist within short driving distance of Nimes. Such areas are especially looked after by the local parks and forestry authorities for the well-being of all ramblers, hikers and nature lovers. Mont Cavalier, in the Jardins de la Fontaine, is crowned by the Tour Magne (Great Tower), an ancient Roman tower still open to the public. The nearby Pont du Gard, the famous aqueduct straddling the Gardon valley, was also built by Agrippa. The cathedral, partly Romanesque and partly Gothic in style. Kisho Kurokawa’s building constructed in the form of a hemicycle to reflect the local amphitheatre. Nîmes was located on the Via Domitia, a Roman road constructed in 118 BC, that connected Italy to Spain. It was also an important staging post in the early Middle Ages for pilgrims en route to Saint-Gilles du Gard along the St Giles Way. 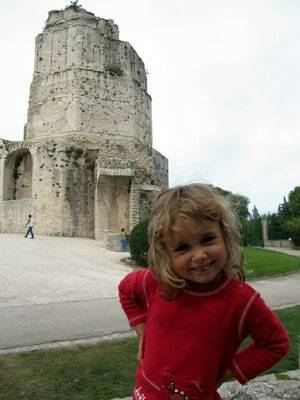 Click for further historical details on Nimes or for information on our hiking France tour around Montpellier, Nimes and Uzes called Rambling in Languedoc. 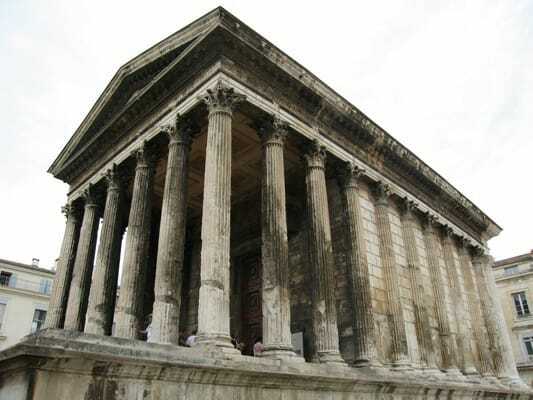 Alternatively, contact us for a guided walking tour of historic Nimes and its surrounding areas. Situated on a hill in the heart of the City, the remarkable Fontaine Gardens were created on a magnificent fifteen hectare site of historical interest and natural beauty. A Européen public garden of the highest stature, it makes the perfect half-day ramble and comprises two distinct gardens designed in very different styles: a ‘jardin classique’, typical of the seventeenth century, and a landscaped ‘jardin méditerranéen’. Started in 1745 at the behest of the then king of France, Louis XV, it was designed by Jacques Philippe Maréchal, the King’s chief engineer and Director of Fortifications in Languedoc. Like many other grandiose projects of the time, the multi-terraced concept was never fully completed. Nevertheless, it remains a remarkable feat of horticultural engineering in a haven of tranquility, the likes of which will delight the senses of all cultured ramblers who enjoy hiking France and French gardens.